You can watch videos with the best moments of MTB WOC & JWOC 2010. Organization video channel (18 videos). Portuguese Newspaper Record video channel (13 videos). Below is available the video of Open Ceremony which you can find in Organization channel too. Paulo Alipio from Portugal was the last athlete in "25 Days 25 Names". There you can know some features about the best MTB-O Athletes of world and who came to Portugal during MTB WOC & JWOC 2010. They described themselves and their goals in World Championships 2010. Headcam footage from the relay. Source www.stodgell.co.uk (Mark Stodgell GBR). Relay Video by Portuguese Newspaper Record. The last day of MTB WOC & JWOC 2010 confirmed the expectations and Relay was a so exciting Mountain Bike Orienteering event which will remain unforgettable for teams and spectators. The team of Russia (Ruslan Gritsan, Valeriy Glukhov & Anton Foliforov) overcame in the battle for the gold medal in WOC Men (2:45:34) versus the team of Denmark (2:46:09). Russia is the new World Champion and Bjarke Refslund, Erik Skovgaard Knudsen & Lasse Brun Pedersen won the silver medal. The team of Czech Republic (Radek Laciga, Jan Lauerman & Marek Pospisek) finished on third position (2:48:10). The WOC Women Relay had two first legs with small time differences between best teams but Rikke Kornvig “flew” to Denmark victory in third leg. Ann-Dorthe Lisbygd, Line Brun Stallknecht & Rikke Kornvig holder the gold medal (2:56:56). The team of Finland (Kaisa Pirkonen, Ingrid Stengard & Marika Hara) won the silver medal (3:01:46) and Czech Republic (Barbora Chudikova, Hana La Carbonara & Martina Tichovska) finished only 12 seconds behind (3:01:58) on the third position. In JWOC Men Relay, the team of Czech Republic (Krystof Bogar, Martin Tisnovsky, Vojtech Stransky) took the first position (2:57:16) and Russia (Mikhail Utkin, Grigory Medvedev, Petr Ryabinin) won the silver medal (3:02:01). Tuomo Lahtinen, Joakim Hostman & Samuel Pokala (team of Finland) finished only 28 seconds behind Russia and reached the last podium place. Olga Vinogradova hadn’t luck and when she was the leader a puncture dismissed Russia of the battle for victory in JWOC Women Relay. The team of Czech Republic (Martina Lamichova, Marie Brezinova & Magdalena Seifertova) won the gold medal (2:30:46) and on second position you can find the team of Russia (Tatiana Repina, Anastasia Bolshova, Olga Vinogradova)(3:02:03). Tamara Haindl, Julia Ritter & Christina Traint from Austria finished on third position (3:25:31). At 10:00 the first runners of WOC men's relay start the first course and WOC women’s start ten minutes after. Men’s course is 20,2 km / 480 m / 15 controls and for women’s is 16,2 km / 330 m / 13 controls. The JWOC mass start of first leg is at 10:20. The optimal length for JWOC Men is 15,9 km and 14 km for JWOC Women. List with all teams is available here. Follow Relay Event in Live Blog. One day after the glorious victories of Olga Vinogradova and Pekka Niemi in JWOC Middle Distance Final, they repeated in Morgade the demonstration of their talent for Mountain Bike Orienteering. Both win the gold medal in Long Distance Final. The JWOC Men Long Distance Final was unforgettable whereas when Maciej Gromadka had the best final time almost at the end of race, Pekka Niemi finished with less one second than Gromadka. Pekka Niemi was the fastest runner (1:46:00), Maciej Gromadka won the silver medal (1:46:01). The other man who reached the medal position is Vojtech Stransky from Czech Republic (1:49:09). Olga Vinogradova from Russia is the king of Long Distance among women (1:26:29). She took the lead at the beginning and didn't lose time after at all, so she won her second gold medal in MTB WOC & JWOC 2010. The second place went for Brigitta Koos (1:31:54), almost six minutes behind the champion. Barbro Kvale from Norway is the new holder of bronze medal (1:34:25). The 6th day of MTB WOC & JWOC 2010 was full of joy and emotion, with an unknown winner until the end. Morgade received a fantastic Long Distance Final where all athletes could enjoy challenge courses in a hilly terrain. Anton Foliforov from Russia is the new holder of gold medal (1:53:02), followed by Sprint World Champion Adrian Jackson (1:55:05), who won the silver medal. Erik Skovgaard Knudsen finished on third place and wins his first medal in MTB WOC 2010. Among women the winner of silver medal in Sprint Final, Christine Schaffner from Switzerland was the fastest (1:54:05). The competitor in the second place is Russian Ksenia Chernykh who is almost 3 minutes behind the champion (1:56:42). Marika Hara from Finland deserved the bronze medal (2:01:13). Margus Hallik, first runner of WOC men will leave start at 9:00, so the fight for the medals of Long Distance Final will be going on after this time. Men's course 38,1km / 1250m / 17 controls, expected winning time 110 minutes. Last runner start at 11:57, so we will have a new world champion at 13:47. Yoshiko Sunada who starts her race seven minutes after the first men, is the first WOC Women in StartList. Women's course 30,2km / 935m / 16 controls, expected winning time 95 minutes. We will know the new world champion between women's approximately at 13:30. In JWOC, Andrej Cully and Ekaterina Kupryashkina will start the Long Distance Final at 9:02. The JWOC winners will be known at 13:30 among men's and one hour before for women's. Terrain is hilly, mostly forested but with some open areas and has well defined tracks with generally good going. To follow Long Distance Final we provide Live Blog, Live Split Times (2 Radio Controls) and Preliminary Results updated every minute after the arrival of first runners (see Long Distance Final section). Margus Hallik, first runner of WOC men will leave start at 9:00, so the fight for the medals of sprint will be going on after this time. Men's course 38,1km / 1250m / 17 controls, expected winning time 110 minutes. Last runner start at 11:57, so we will have a new world champion at 13:47. Terrain is hilly, mostly forested but with some open areas and has well defined tracks with gemerally good going. To follow Long Distance Final we provide Live Blog, Live Split Times (2 Radio Controls) and Preliminary Results updated every minute after the arrival of first runners. During the qualification for the Long Distance Final, the athlete Hana Dolezalova from the Czech Republic suffered a fall. She was taken to the Hospital Stº António in Oporto. Below you can watch two videos of WOC Long Distance Qualification and JWOC Middle Distance final in Avelelas (Chaves). So many videos of all races are available in "WOC & JWOC Videos" section. Long Distance StartList is available here (startlist for W21 classe was changed at 13:07). Avelelas (Chaves) was this morning the World Centre of Montain Bike Orienteering. It receives WOC Long Distance Qualification and JWOC Middle Distance Final. Pekka Niemi from Filand is the new Middle Distance World Champion among JWOC men's after winning the event in Avelelas. In second position finished Krystof Bogar and third place went to Mikhail Utkin. In JWOC Women Olga Vinogradova won the Gold Medal and Barbro Kvale finished on second place taking 2minutes and 24 seconds longer than Russian Vinogradova. In third place we can find Magdalena Seifertova from Czech Republic. In the same map there was the WOC Longe Distance Qualification. Kevin Haselsberger, Anton Foliforov and Erik Skovgaard Knudsen were the winners of three men qualification groups. On other hand, in WOC Women Martina Tichovska and Ksenia Chernykh finished their qualification groups in first place. During the qualification for the Long Distance Final, the athlete Hana Dolezalova from the Czech Republic suffered a fall. After being assisted in the local, she was taken to the Hospital Stº António in Oporto. Her life is not at risk. The Organization of the Event wishes she recovers soon. 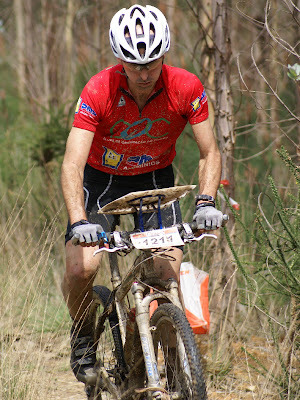 Friday will be the Long Distance Final which we wish to be memorable with good MTB-O maps and challenge courses. Today Avelelas (Chaves) is the World Centre of Montain Bike Orienteering, it receives WOC Long Distance Qualification and JWOC Middle Distance Final. We will know the JWOC Middle Distance World Champions until 14 o'clock here in Nothern of Portugal. Andrej Cully from Slovakia is the first athlete of JWOC Men startlist at 10:30. WOC Long Distance Qualification starts at 10:30 and the start interval is 3 minutes. Courses have a optimal length 19,7/20,5km for Women and 24,5/24,8 for Men. Weather report: we have some clouds, a temperature between 24ºC and 27ºC but sun will shine whitin few minutes. Long Distance Qualification and JWOC Middle Distance Final Start List are available here. Samuli Saarela didn't give a chance to any opponent, becomes the Middle Distance World Championship with 1:06:34. Second place in WOC MEN went to Sprint Final winner Adrian Jackson but he was 40 seconds behind Saarela. In third position we can find Italian Luca Dallavalle with 1:10:02. One hour and thirty nine seconds was the time that Michaela Gigon need to win the gold medal among women's. Rikke Kornvig was the fastest one of the others winning the silver medal taking 33 seconds longer than Gigon Marika Hara from Filand was the last women athlete called to podium in WOC Women. Was a fantastic race with good maps, challengue courses and so much emotion in arena which was located inside the green spaces on the left side of Cávado River. Cávado River provided a wonderful scenario for Middle Distance Final that all participantes will save in their memories for a long time. WOC Sprint Head Cam Footage!